Until recently it was believed that species of different biological types cannot be crossed. However, a number of facts and scientific experiments indicate that this belief can be argued against, at least when it comes to mammals. An unbelievable incident occurred not so long ago in Jiangxi , a Chinese province. A dog owned by a peasant named Tsen gave birth to three creatures. One of them was a regular puppy and two others were kittens. People have been trying to cross different types of animals for a long time. The mule is a well known hybrid of a horse and a donkey. Mules are known for their stamina, and were used to transport goods for long distances in ancient times. There are hybrids of tigers and lions, lions and leopards, wolves and dogs, zebras and horses, donkeys and ponies, camels and llamas, grizzlies and polar bears, false killer whales and dolphins. Humans even managed to get hybrids of the hybrids – for example, a cross breed of tiger and a hybrid of tiger and lion. Biologists from the French Institute for Agronomy Research (INRA) managed to implant a female European royal deer with an artificially inseminated egg cell of a Japanese sika deer. Scientists believe that this way they will be able to preserve rare and extinct animals. However, a fetus will only survive if a surrogate mother and the “adopted” fetus are of close breeds. Soon researchers are going to recreate a livestock of Persian fallow deer and Elda deer that live in Iraq and Iran. Normally crossed animals do not breed in nature and human interference is required for breeding. Scientists often discuss ethical aspects of creating mutants that have both animal and human genes. For example, scientists from the Stanford Stem Cell Research Institute conducted experiments where they implanted human neurons into the brain of mouse embryos. The mutant was killed right before its birth, and the scientists performed an autopsy to study its brain structure. Scientists are preparing an experiment where they will grow a human body out of genetically modified mice cells. Genetic modification will allow rodents’ reproductive organs produce human sperm that will be later used for creating a human embryo. According to Cell Research magazine, Chinese scientists from Shanghai Second Medical University managed to create a hybrid of a rabbit and a human being. They used skin cells from two men, one woman, two boys and a rabbit ovary cell for the experiment. The researcher removed DNA from the rabbit ovary cell and implanted it with human DNA. Only 100 of 400 embryos survived. However, all embryos were destroyed at a certain stage of their development. Similar experiments were conducted earlier in Massachusetts (the USA), where scientists tried to cross human and cow genes. But the experiment failed. Sydney researchers implanted a lamb fetus with human bone marrow cells. The fetus developed human bones and muscles. The next step was creating a hybrid of a human being and a pig. Human cells were implanted into the nucleus of a pig’s ovary cell. 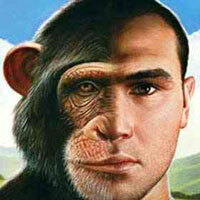 The animal genetic code was removed. The embryo lived for 32 days before it was destroyed by the scientists. Scientists from the Centre for Cellular and Molecular Biology in Hyderabad, India , managed to bring to life the idea of the renowned horror movie of the 1980s, The Fly. In the movie fly genes penetrated into a human body, but in the experiment a fruit fly was injected with a human gene. The fly was supposed to be used for testing new medications against cancer. Chinese scientists grew a human ear on the back of a mouse. This means that certain human organs can be grown for transplants. The main concern is to not to allow the cells of the animal incubator to penetrate the organ. What about the “dog-cat” phenomenon mentioned above? Could it be a case of artificial crossing? It may be that Tsen’s dog was a part of an experiment conducted by some outstanding scientist or even an entire secret laboratory. But why do they keep their discovery secret?